Kavango Resources Plc (“Kavango” or the “Company”) is seeking an Initial Public Offering (“IPO”) on the Standard List segment of the London Stock Exchange (the “Standard List”). As part of its IPO, Kavango is seeking to raise up to £2.1m at a price of 2.5 pence per share, through the issue of up to 35,000,000 shares (the “Placing”). Assuming Kavango raises the full £2.1m, the Company will have a market capitalization of £6.55m on successful completion of its IPO. The completion of the Placing is conditional on Admission to the Standard List (“Admission”). As part of the Placing each prospective Placee will be offered one New Ordinary Share of £0.001 in exchange for every £0.025 invested, all such New Ordinary Shares to be issued with Warrants attached on a one for one basis. Each Placing Warrant entitles the warrantholder to subscribe for one Ordinary Share at a price of 12p with a further warrant attached for each two Ordinary Shares subscribed for under those warrants, such new warrants entitling the warrantholder to subscribe for one further Ordinary Share for each such new warrant at a price of 24p. 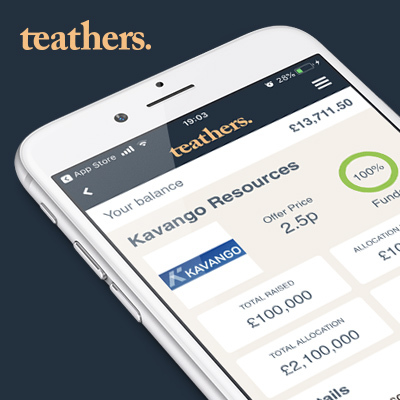 Onboarded users of the Teathers App may subscribe for ordinary shares in Kavango at 2.5p per share (the “Deal”) on the terms described above, including the award of warrants. Any subscription for shares in Kavango via the Teathers App may be subject to scale back. Dealing is expected to commence in Kavango’s shares on Wednesday 27 June, when the Company is expected to complete its IPO. Settlement of the Deal is expected to occur on Wednesday 27 June. Contract notes will be issued on settlement and completion of the Deal. The Deal will open on the Teathers App at 5pm on Friday 08 June and will close at 1700 on Wednesday 20 June. The Net Proceeds of the Placing will provide the Group with working capital to advance its work programme, which will include the fees in respect of the proposed airborne EM survey at the KSZ Project. Please refer to the Company’s latest presentation (May 2018) on its website for more information http://www.kavangoresources.com/index.php/investor-relations/presentations/download-file? Kavango, via its subsidiary Kavango Minerals has an interest in 15 Prospecting Licenses covering two areas in Botswana. These are divided into: a) the Northwestern Botswana project (referred to herein and the CPR as the “Kavango Copper Project” or “KCP”); and b) the Kalahari Suture Zone project (the “KSZ Project or “KSZ”) (located in Southwestern Botswana). Kavango Minerals is the holder of all of the licences comprising the KCP, however RTME is the operator and currently funds 100% of the expenditure on one of the PLs (253/2012) which is subject to a JV Earn In Agreement. The other two PLs have been assigned out of the JV Earn In arrangement to Kavango Minerals. Kavango Minerals is the holder of 12 PLs in respect of the KSZ Project. Both Projects are regarded as ‘early stage exploration projects’ and are therefore speculative in nature. However, based on current geological evidence, the Competent Person is of the opinion that the Projects have sound technical merits to be considered prospective, subject to varying degrees of exploration risk, and warrant the exploration programmes proposed by the Group to assess their economic potential. There are currently no mineral resource or reserve estimates on either of the Projects. Exploration Rationale KCP The exploration rationale in relation to the KCP is premised on the interpreted correlation between Proterozoic rocks underlying Kalahari cover in Northwest Botswana and the Katanga Sequence which hosts the Central African Copperbelt deposits in Zambia and the DRC. Northwest Botswana is considered prospective for exploration targeting of sediment-hosted copper- cobalt deposits as well as related structurally controlled secondary copper- cobalt deposits. Previous work has provided sufficient encouragement to warrant further exploration. Work conducted by Kavango Minerals and RTME to date has been insufficient to test this rationale and additional exploration work is necessary to confirm the interpreted stratigraphic correlation and identification of appropriate targets for drill testing. KSZ In respect of the KSZ Project, after a review of historic borehole material, aeromagnetic and gravity data from this Project, Kavango Minerals carried out various ground geophysical and soil sampling surveys and concluded that an airborne electromagnetic survey over the bulk of the Project area should be conducted to assess the possibility of buried Ni-Cu-PGE sulphide mineralisation along and adjacent to the Kalahari Suture Zone. Proposed Work Programmes KCP Project The work programme proposed by RTME for PL253/2012 is initially aimed to test targets in a defined prospective portion of the PL area. This will involve drilling of targets generated by exploration work carried out by RTME in previous years. No significant field work is planned by the Group on the remaining two licenses in the KCP (248/2014 and 302/2012) for the time being save for a small amount of geophysical work required to maintain the PLs in good standing. KSZ Project Kavango Minerals has prepared a staged exploration programme and the Competent Person supports this plan to conduct an EM survey over the KSZ area. The airborne survey will be split into sectors so that the exact area covered can be discretionary, dependent on the Net Proceeds. As results become available from the EM airborne study, it is proposed that the Group will use a second geophysical consulting company for the interpretation of the EM data and to ground-truth a broad range of identified EM anomalies (if any) by refining existing ground geophysical traverses, or establishing new grids over the respective anomalies, prior to drilling. If identified, drill the most compelling conductors to achieve intersections of sulphide mineralisation. In addition to the above, the Net Proceeds will be used to purchase an additional 4×4 vehicle and rent a lodge for staff as an operations base for the KSZ Project. Kavango Minerals is in the exploration and appraisal phase. Kavango Minerals is in the exploration and appraisal phase of its development. Both Projects are regarded as ‘early stage exploration projects’ and are therefore speculative in nature. There is no guarantee mineralisation will be found. The Company, as the holding company for the Group, is entirely dependent on the success of Kavango Minerals, its ultimate subsidiary. To date, Kavango Minerals has received financing of approximately $2m to fund its work programme from Navassa (its parent company) and via earn in payments pursuant to the JV Earn In Agreement. Following Admission, the Group proposes to use the Net Proceeds to conduct a helicopter-borne Electro-Magnetic (EM) survey over substantial parts of the KSZ licensed area to ascertain the existence of geophysical conductors which may represent mineral deposits. An amount of £800,000 will be used to survey an area which the Directors believe will be sufficient and adequate. Such survey is expected to take approximately 5 months. It is estimated that the costs of drilling any prioritised target areas is £476,430 (although much will depend on how many areas are prioritised and the depth of drilling required). Kalahari sand and Karoo sediment cover the areas subject to the PLs making exploration more expensive and risky. In relation to the Ditau area (KSZ PL169/2012), this is more advanced than other areas within the KSZ Project as previous study work has been carried out by Kavango Minerals prior to the Acquisition. The Group will commence drilling in this area concurrent with the proposed EM survey outlined above. Failure to conclude the proposed work programmes within a reasonable time and within the planned budgets, or failure to identify mineralisation will have a material adverse effect on the Group’s business, results of operations, financial condition and/or prospects. It is possible (but not guaranteed) that in that instance the Group could still operate as the Directors would use their experience to diversify areas being surveyed, with the acquisition of additional licences or by entering into joint venture agreements, in order to find ways to enhance shareholder value. The Company is a newly formed entity with no operating history and no historical revenues and is reliant on the success of Kavango Minerals. The Company is newly formed, having been incorporated on 31 May 2017. Its first acquisition was of Navassa on 7 December 2017. The Company is currently the holding company of the Group and will not itself be operating or generating revenues. It is, therefore, entirely dependent on the success of Kavango Minerals, its ultimate subsidiary. Should Kavango Minerals not identify any mineral deposit or be unable to extract any assets identified, this will have a material adverse effect on the financial condition and/or prospects of the Company and its investors. It is possible (but not guaranteed) that in that instance, subject to necessary funding remaining available, the Group could still operate as the Directors would use their experience to diversify areas being surveyed, with the acquisition of additional licences or by entering into joint venture agreements and/or modifying the then work programme, in order to find ways to enhance shareholder value. Kavango Minerals’ capital requirements In the event that any mineralisation is identified, the Group will have further funding requirements after 18 months from the date of this Prospectus to define further such mineralisation with the aim of delineating a JORC compliant resource and completing feasibility studies. The ability to obtain additional financing will, at the time, be affected by matters such as the demand for securities and the condition of financial and commodity markets generally. If the Group cannot obtain the funding required on terms it considers reasonable, or in the then required timeframe, this will have a material adverse effect on the financial condition and/or prospects of the Company and its investors and could include the loss of the relevant licences. Risks associated with the JV Agreement with Rio Tinto Mining & Exploration (“RTME”). The JV Earn In Agreement was entered into between Kavango and RTME on 8 August 2014, became effective on 20 October 2014 and was amended on 6 March 2017. This agreement currently relates to one PL area in the KCP which is presently being managed and funded by RTME. The agreement entitles RTME to “earn into” that project subject to certain criteria being met which include stage payments and work commitments. RTME’s exploration programme may not discover any deposits of minerals within the relevant PL area or if it does, it may not be of a deposit size which is of the scale to be viable for RTME. Moreover, RTME has the right, without reason, to terminate the JV Earn-In Agreement at any time. If RTME terminates the JV Earn In Agreement, the annual option fees would no longer be paid and the earn-in payment due of $2.5 million (to be paid on the completion of the last stage of the earn in) would not be met. As well as this loss of income, the Group would then need to meet all of the regulatory payments and requirements in order to keep the PL active. If this could not be done, the licences would lapse. The work programme and budget table (contained in E2) includes an amount of £79,365 (which could be diverted from the Exploration Costs) in respect of the licence fee commitments for the PL subject to the JV Earn In Agreement to the end of December 2019. If this was not sufficient to meet the expenditure requirements, the PL subject to the JV Earn In Agreement would lapse. RTME further has the right to sell its interest in the JV Earn In to a third party whom it may nominate. Although Kavango Minerals has no right of veto under the agreement, this third party may not be acceptable to the Group and their interest may not be aligned or they may not have the same credibility as RTME. If any of the above events were to occur, this could have a material adverse effect on the Group’s financial condition and prospects. The Company may not be able to renew its Prospecting Licences and/or obtain Mining Licences Each of the Group’s PLs expire at the end of 2019. Of these, 1 PL in the KCP Project and 7 PLs in the KSZ Project will not be extended (as these licences have been extended previously). Accordingly, application will need to be made for the relevant areas of these PLs to be converted into Mining Licences (this can also be done during the tenure of a PL). Applications for the renewal of prospecting licences (that can be renewed for a further term (or terms)) can be refused or rejected if the applicant has not carried out the work programmes and/or met the expenditure commitments agreed at the time the applicable prospecting licence was granted. The application could also be rejected if the proposed work programmes and/or expenditure commitments are considered by the Ministry of Mineral Resources to be inadequate for the renewed term. However, before any such application is rejected, the Minister shall usually give notice of the intended rejection and allow the applicant the opportunity to rectify the default or amend the proposed programme. An initial prospecting licence is valid for a maximum of three years. On expiry, an application for renewal is permitted for a maximum of a further two years. Thereafter, an application for renewal for a further 2 years is permitted. Licences should be renewed provided (at each time) the applicant is not in default (as described above), and the Ministry considers that the proposed work programme and expenditure is adequate. A ML will give the holder the right to develop a mine and extract and beneficiate minerals (subject to specified conditions). It is usually valid for a period up to 25 years and is renewable on application. It is incumbent upon the holder to produce an Environmental Impact Assessment and Environmental Plan before permission will be granted for mining to commence. Other matters that will need to be resolved include ownership of the land, compensation, and royalties to be paid to the Government and local communities. Accordingly, it is important that prior to such application, Kavango Minerals has identified any suitable areas of interest via the proposed EM survey and the drilling programmes. If it has not done so, it may lose or relinquish its licences or have failed to identify the correct areas (that is, areas containing mineralisation) which will have a material impact on the success of the Group. Furthermore, there is no guarantee that a ML will be issued to Kavango Minerals or that Kavango Minerals will have sufficient funds to meet any conditions of the ML. Of the PLs which can be renewed beyond 2019, there is no guarantee that any of them will be renewed. If these PLs are not renewed or if new PLs are applied for and not granted, this could have a material adverse effect on the Group’s business, prospects, financial conditions and results of operations. The Group faces governmental regulation and regulatory risk. The production and sale of metals are subject to various state and local governmental regulations, which may be changed from time to time in response to economic or political conditions and can have a significant impact upon overall operations. Although this has not occurred in Botswana in the last 5 years, it is conceivable that new regulations could be imposed compelling mining companies to beneficiate the mined products within Botswana rather than export them as raw materials or increasing the royalties to be paid to the government or local communities. An increase in future production costs could have a material adverse effect on the Group’s profitability. An increase in the Group’s future exploration and production costs could have an impact on its profitability. Changes in the costs of its mining and processing operations could occur as a result of unforeseen events, including international, local economic and political events, and could result in changes in profitability or reserve estimates. Many of these factors may be beyond the control of the Group. Contractors or supplier failure. During the exploration phase, Kavango Minerals will engage two principal contractors – a geophysical company responsible for the airborne survey and a drilling company. Whilst every effort will be made by the management team to have robust contracts in place with reputable companies, there can be no guarantee that the supplier will be able to deliver the services for the duration of the agreement, which will result in the Group’s current timetable being delayed. Failure of a contractor or a supplier could, therefore, have an adverse effect on the Group’s business, results of operations, financial condition and/or prospects, which in turn may have a negative impact on the Group The volatility of commodity prices could harm the Group’s business. The Group’s future revenues, profitability and growth as well as the carrying value of its mining properties depend to a degree on prevailing prices. The ability to borrow and to obtain additional funding on attractive terms depends upon the then prices. Prices are subject to fluctuations in response to relatively minor changes in the supply and demand, uncertainties within the market and a variety of other factors beyond the Group’s control. Along with most commodities, the price of base metals has been generally depressed since the 2008 financial crisis. However, since the end of 2016 there has been a slow but sustained recovery of prices. Whilst this may have a positive impact on the prospects for the Group in the short term, there is no guarantee that this positive trend in prices will continue. There are risks relating to the Ordinary Shares The Standard Listing of the Ordinary Shares will afford investors a lower level of regulatory protection than a Premium Listing. A Standard Listing will not permit the Company to gain a FTSE indexation, which may have an adverse effect on the valuation of the Ordinary Shares. Any further issues of Ordinary Share may dilute the investors’ shareholdings. Returns on investment may not be realised within investors’ perceived reasonable timescales, due to the potential illiquidity of the Ordinary Shares The Company may be unable or unwilling to transition to a Premium Listing in the future. Fluctuation The Company’s share price will fluctuate and may decline as a result of a number of factors, some of which are outside of the Company’s control.